How do I backup and restore my Nexus 7 (2013)? Note: By performing a factory data reset, all data will be wiped from the device. 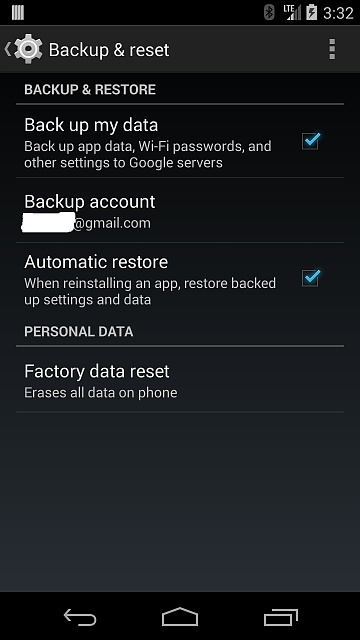 While any data stored in your Google Account will be restored, all apps and their associated data will be uninstalled. Go to Settings > Backup & reset. If your tablet is password protected, you'll be prompted to enter your Pattern, PIN, or Password. Touch Erase everything to confirm. If your tablet is on, power it off. Press and hold Power until the device powers on, then immediately press and hold Volume Down (while still pressing Power). You will see the word Start with an arrow drawn around it. Press Volume Down twice to designate Recovery mode. Press Power to restart into Recovery mode. You will see an image of an Android robot with a red exclamation mark. While holding down Power, press Volume Up. Use the volume keys to scroll to "wipe data/factory reset" and press Power to select it. Scroll down to "Yes - erase all user data" and press Power to select it. Note: If at any point during the above steps your tablet becomes unresponsive, you can restart it by holding down the power button for several seconds. And how would I go about backing it up? What do you need to back up? You can connect it to a PC and copy any photos, videos, music or documents. As for apps, they will all come back when you re-sign into your Google account. Settings and data as well if the developer of the app included that. How would i back up app settings and other data? How long is it supposed to take to wipe? So I've done a reset. I backed up all of my data through Windows Explorer and saved every single file and folder. I've copied them over to my Nexus through the same method however it seems none of the apps are showing up. What do I do? After a factory reset, it should have been like when you first got it. It asks for your gmail account info and then asks if you want to restore your apps. Also, you restore the apps before you copy anything back. Also, did your settings look like this before you wiped it? Yup been through all of that. I used Carbon to back everything up before I copied and pasted all of the folders from my 7 to my PC. Now that I've pasted everything back to it, nothing seems to appear. How can I make it work? I don't think it is a matter of pasting folder back. With apps like Carbon you simply do the backup, factory reset the phone and then go through setup again but skip the option to restore your apps. Then reinstall Carbon and run the restore option and let it put everything back. Don't think of it like a Windows backup/re-install. One caveat, if 1 or more of your apps caused any of the issues in the first place it is gonna happen again. It's a hardware fault so I've had to use Asus' crappy service to try and get it repaired. Their website can't even recognise my serial number. Never buying anything Asus again. I've had an Asus laptop with horrible build quality and a loose battery. Absolute bullsh*t.
On the Backup and Reset screen, my backup account is grayed out and says that there is no account that it is backing up to. When I touch it, it won't let me enter an account. Backup and restore are checked but I can't seem to enter an account. Any idea how I enter an account? I'll give that a go if I ever need to back it up but the problem is restoring the device. If it lets me do that then I'll definitely check it out. Will prices go down with the Nexus 8 likely coming out in April?